Central American Migrants Arrive At U.S. Border To An Uncertain Future : The Two-Way A group of migrants, mostly from Honduras, Guatemala and El Salvador are seeking political asylum in the U.S. Their trip has garnered heavy attention following remarks by President Trump. 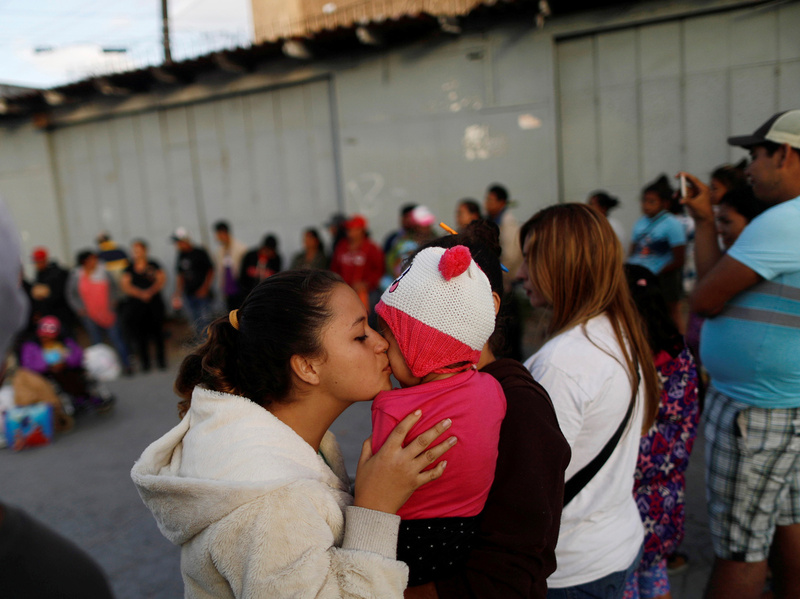 A member of a migrant caravan from Central America kisses a baby as they pray in preparation for an asylum request in the U.S., in Tijuana, Baja California state, Mexico. A group of roughly 200 people traveling from Central America, arrived at the U.S.-Mexico border Sunday seeking political asylum and were greeted by supporters across a border fence in the U.S. holding welcome signs. But upon the group's arrival, U.S. immigration officials announced that the port of entry in San Diego County had reached capacity. Officials had warned that the crossing might fill up as its capacity is just around 300 people, according to The Associated Press. "At this time, we have reached capacity at the San Ysidro port of entry for CBP officers to be able to bring additional persons traveling without appropriate entry documentation into the port of entry for processing," U.S. Customs and Border Protection Commissioner Kevin McAleenan said in a statement. "Those individuals may need to wait in Mexico as CBP officers work to process those already within our facilities." Despite the news that the crossing was full NPR's Carrie Kahn reports that members of the caravan were not immediately deterred — still forming lines and hoping to march toward the crossing. If migrants approach the crossing and are turned away they would have to stay in Mexico — a decision that others had already made. The migrants are facing an uncertain future wherever they land. Many have decided not to seek to asylum in the U.S. after speaking with volunteer immigration lawyers, who have advised the migrants to be prepared for separation. The weeks-long trek by this so-called caravan is an annual, organized trip. Most of the people are from Honduras and are fleeing the violence that erupted after the highly contested presidential elections in November. Many people are also from Guatemala and El Salvador, where gang violence is prolific. This year's journey, however has been the target of harsh political rhetoric and ire from President Trump. He points to the group of migrants as justification for increased security, namely a border wall. Trump has also called on the Mexican government to stop the caravan before it reaches the border. The demands come amid increased tension between the two countries as they seek to hammer out a revised North American Free Trade Agreement. Trump has gone as far as to threaten NAFTA, calling it Mexico's "cash cow," if the country did not act to slow traveling migrants. A number of migrants seeking asylum Sunday decided to change course along their journey, so much so that it momentarily stalled the trip. Central Americans face an uphill battle when seeking asylum in the U.S. NPR's Eyder Peralta reported that in 2010, 9 out of 10 Hondurans and Salvadorans were denied asylum, as well as 8 out of 10 Guatemalans. "If members of the 'caravan' enter the country illegally, they will be referred for prosecution for illegal entry in accordance with existing law. For those seeking asylum, all individuals may be detained while their claims are adjudicated efficiently and expeditiously, and those found not to have a claim will be promptly removed from the United States." Among the people planning to apply for asylum Sunday are many women and children. The U.S. has been reportedly been separating children and families to deter illegal immigration practices. Migrants seeking asylum in the U.S. are often detained, then released while their asylum claims is processed. This procedure has been dubbed by critics of immigration as "catch and release." A Salvadoran Woman Missed Her U.S. Court Date. What Happens Next? If members of the caravan are detained and released, some activists across the country are offering a place to stay while the migrants await a decision on their asylum. This includes Grace Aheron, with the network Showing Up For Racial Justice, which is organizing hosts. She shares a house with four other SURJ members in Charlottesville, Va., and they felt compelled to help. "Many of us have connections to immigration," Aheron told NPR's Camila Domonoske. "It felt like the least we could do ... to give these people that are coming from such incredibly intense and violent situations a soft place to land in the U.S."
A previous version of this story misspelled the name of NPR reporter Carrie Kahn as Khan. Additionally, the Department of Homeland Security was incorrectly called the Department of Homeland's Security.